Do you think you’ll have enough income to cover your child’s college costs as she incurs them? If so, you may consider paying as you go. Or you may find a combination of savings and support from your current cash flow while your child is in college to be your best strategy. For example, say that you want to earmark $200 a month to go toward offsetting any costs for your son’s college education. Your son is currently 15 and plans to start college in three years. So, your computation would go as follows: $200 times 36 months equals $7,200. When your teenager gets ready to attend college three years from now, you will have accumulated enough money to pay for two years of tuition, fees, books, and supplies at a community college or possibly one year of the same type of expenses at an in-state public university. Then, over the next four years while Danny is in college, you will accumulate, or possibly write checks directly to your student or the college, another $9,600, which you pay out of your current income. This strategy goes a long way toward paying for a big portion of your child’s tuition and fees. Should you desire and find it financially appropriate to more fully fund your child’s college education expenses, your next option is borrowing. 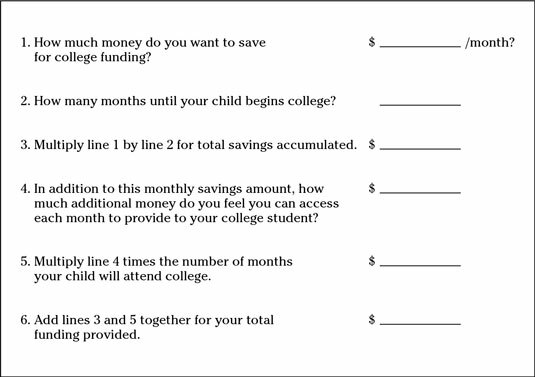 You can use The Save Some Pay Some worksheet to calculate how much savings you will be able to come up with in advance and how much will be available from your cash flow while your kids are in college. You may be able to make up for any remaining balance through grants and loans in your child’s name. Click here to download and print the Save Some Pay Some Worksheet.